After choosing Options from the Title screen, scroll down for more options. These options dictate confirming or saving, always choose them. These are some of the MAP screens referenced in the guide. You will have to manually move around to certain locations. You must follow the order in the guide correctly, because moving to certain locations too soon will advance the story, and some quests only pop up after clearing another. Save beforehand if you want to be careful. When I say "go up" or "go left," it's usually through a door. There are also one-screen areas with buildings you can go into. When in doubt, use to consult the in-game map for the map legend. - This is not a straight-forward, choice-only visual novel. A majority of it will be exploring the aforementioned map like a RPG. Multiple start-to-finish playthroughs are necessary. - There is an auto save file kept above your manual saves. Ignore this when I ask you to load a numbered save (manual saves are numbered). - Utilize the auto save, but also keep a separate save file in case you mess up. I suggest saving each time you reach a new MAP segment. - After clearing a route, that data will be carried over and you will get an ability to relocate points that dictate which routes are available to you. However, if you load up an in-game save, then try to start a new game, you will lose this ability and only get the data (items, money, etc) from that particular save. So only start a new game after clearing a route. Otherwise you will have to load up a save and replay through to the ending. Basically, just follow this guide. On name screen, select right-most button on bottom right, then left option. Use touchscreen to sign your name. Sign anything you want. Confirm with right-most button on the bottom right, then confirm with left option. Press or tap the screen again to advance. Skip tutorial with left-most button on bottom right. - Go right all the way and examine bookcase. - Go to next room and examine pink chest. - Go to next room and examine pink chest. Examine bookcase right next to it. - Go up, examine book on table. Talk to green "Quete" marker. For these Quests, manually skip through with and confirm with left option. - Return to previous room, go right. Examine book on table. - Go left all the way. Examine book on table. Talk to green "Quete" marker. - Go right two rooms, talk to pink "Quete" marker. Talk to new orange "Quete" marker. - Go left all the way, go up three times. Examine the pink chest next to the door. Talk to both green "Quest" markers (one is further up). - Go immediately right. Talk to green "Quete" marker. Examine pink chest. - Go left and down all the way. Talk to pink "Quete" marker. - Go right, go up. Talk to pink "Quete" marker. - Go left, go up twice. Talk to white "Evenement" marker toward middle of room. - Talk to white "Evenement" marker toward top of room. !! When you control this brown-haired girl, you will see white pieces of trash on the floor. Walk over them to collect them, they give you money. It's up to you to explore and grab these over the course of the game. - Go up. Examine two books on two tables. Examine pink chest. - Go down, go up the stairs on the left. - Examine pink chest. Go up the next set of stairs. - Examine pink chest. Return to previous floor, then go to bottom-left room (flashing blue). - Go down stairs and talk to white "Evenement" marker. - Talk to white "Evenement" marker. - Go right, examine pink chest and book on table. - Return to previous room, go up, talk to white "Evenement" marker. - Go down into blue part. - Go up stairs twice, enter bottom-left room (flashing blue). - Go right, go up second door, go up. Talk to green "Quete" marker. - Go left, talk to pink "Quete" marker. - Go left, go up into big long room, take middle-right door (there are three right doors). Talk to green "Quete" marker. - Return to previous room, talk to pink "Quete" marker slightly below. - Return right, talk to green "Quete" marker. - Return to previous room, go down, go right twice, go down, go up the stairs. - Examine pink chest. Careful not to accidentally talk to the lady in front of it. - Go left all the way to a big, long room. Examine pink chest at very top. Talk to green "Quete" marker at the bottom. - Go down, talk to green "Quete" marker. - Go up, talk to pink "Quete" marker a little ways up. - Go slightly down and right, talk to pink "Quete" marker. - Go right twice to return to lady standing in front of pink chest. Talk to her (white "Evenement" marker). - Go left all the way, go into blue part. - Avoid blue part where you start. You can go down to return indoors (to collect trash). - Go up all the way this middle street. Examine pink chest. - Go right. Examine the pink chest. - Return to middle street, go down slightly and enter left door. Examine pink chest. Buy at least one item from the shop (top right character) for a trophy. Exit. !! There are two stores in this area, this General Store and a Bookstore at the bottom that will open later. Buying every Bookstore item is necessary for a trophy, so we will work on that over the course of this route. - Talk to green "Quete" marker right across. - Go left into alley. Talk to green "Quete" marker. Go around back of carriage to reach pink chest. - Go right into alley. Examine pink chest. Talk to green "Quete" marker. - Return to middle street, go up. Talk to green "Quete" marker. - Go down into blue part where you started. - Enter directly left. Collect trash for a trophy. Talk to both pink and green "Quete" markers. Exit. - Go up, enter left door. Talk to pink "Quete" marker. Exit. - Go right into blue part. - Go down again into blue part. - Go down to return indoors. Every room on the second floor is unlocked now, so explore to get trash and a pink chest. All the books and bookshelves can't be examined for now. Return outside when you're done. - Go right into building (Bookstore). Examine two pink chests. Talk to green "Quete" marker. - Maneuver behind this guy to talk to the man behind him. Buy all 3000 books and as many 7000 books you can, then exit. - Enter left. Examine pink chest hidden behind the stairs, then exit. - Go up. Talk to green "Quete" marker. - Enter left. Talk to green "Quete" marker. Exit. - Talk to green "Quete" marker slightly down. - Go up and right into building. - Collect some trash for a trophy. - Examine two pink chests. Talk to both pink and green "Quete" markers, then take bottom exit. - Talk to green "Quete" marker right next to you. - Go slightly down and right into alley. Talk to pink "Quete" marker. - Go down and enter left. Talk to pink "Quete" marker. Exit. - Talk to green "Quete" marker across from you. Then enter right. Talk to all three "Quete" makers. Buy the remaining 7000 books. Exit. - Go up and talk to pink "Quete" marker. - Go up and talk to white "Evenement" marker. - Go down to blue part. - Go right all the way, go down the stairs. - Go up, go left, talk to green "Quete" marker. - Return to stairs and make your way back to the big, long room. Go up into blue part. - Go left twice, go up twice. Go up all the way and speak to two characters here (one with purple hat and dress, one sitting on the sofa). These are two dress-up minigames. Go through a few options for a trophy. - Return to stairs, go up, go left all the way. Talk to lady with red hair and black/purple dress with white "Evenement" marker. - Go right, go up, go left. Talk to green "Quete" marker. - Go left, go down, go left. Talk to green "Quete" marker. - Go right, go up, go left. Go up all the way and take topmost-right door. Examine pink chest. - In this same room, go down all the way, then go right. Talk to pink "Quete" marker. - Go left all the way, go up. In the middle there is an orange "Quete" marker partially hidden by a chandelier. Talk to them. - Go down all the way, go right all the way, go up, go down the stairs. - Go up, go left twice, go up. Talk to white "Evenement" marker. 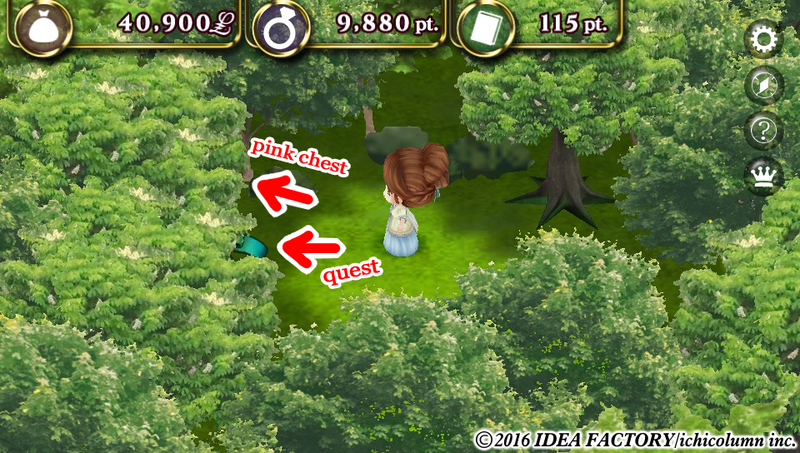 - Examine both bottom corners for two pink chests. - Go up and enter. Talk to white "Evenement" marker. - Exit down, go down into blue part. - Go left, talk to white "Evenement" marker. - Go right, go down, go right and enter blue part. - Go right into Bookstore. If you do not have all 3000 and 7000 books, buy them now. The last two 50000 books are left, but we will buy only one of them in this route, so make sure to collect enough trash by then. - Talk to blonde character with white "Evenement" marker. - Go up into blue part. - Don't go to room directly above you yet. Left room is unlocked. Behind the second bookshelf is a hidden pink chest. - Go up two flights of stairs. Third floor rooms are unlocked. 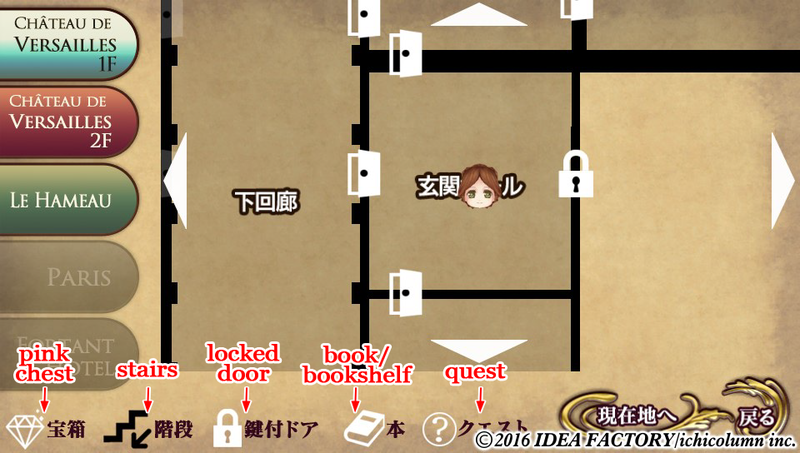 Examine bookshelves, book, and pink chest in the rooms. - Return to first floor and enter top room. - Go down and right into alley. Talk to green "Quete" marker. - Go down and enter left. Talk to both green "Quete" markers. Go up stairs and talk to pink "Quete" marker. Talk to new green "Quete" marker downstairs. Exit. - Go further up and talk to green "Quete" marker. - Enter right and talk to green "Quete" marker. Take bottom exit. - Enter left, talk to both pink "Quete" markers. Exit. - Go down and left into alley. Talk to green "Quete" marker. - Go right and down, talk to pink "Quete" marker. - Enter right and talk to green "Quete" marker. Buy one 50000 book (we can't get the last one now). Exit. - Go up and talk to pink "Quete" marker. Another pink marker is above it, then a green one above that. - Enter left and talk to orange "Quete" marker. Talk to green "Quete" marker that appears after it. Exit. - Go down and talk to white "Evenement" marker. - Go up and talk to lady in green dress with white "Evenement" marker. - Go down and right into alley. Talk to white "Evenement" marker. - Go left and down into blue part. - In this section, there are guards with red circles around them. Some are stationary and some moving. Avoid touching the circles. Also avoid talking to characters. Both instances will send you back to your starting point. - Go right twice, go into blue part. - Go up, go down the stairs. - Go left, go up twice, go into blue part. - Go up, go right into white "Evenement" marker. - Go down, go right twice, go down, go up the stairs. - Take left door down, talk to white "Evenement" marker. to skip through credits. There will be scenes in between. - Go up and right into alley. Talk to character in black clothes with white "Evenement" marker. - Go up all the way into blue part. Play all the way through to the next MAP segment. After game autosaves, exit to Title Screen. - Avoid red guards and don't talk to characters. - Go right, go up, examine the three bookshelves on the sides (they're flashing). - Go down, go right, go into blue part. - Go left, go up twice, go into the blue part. Examine bookshelf afterward. - Take top-most right door and talk to green "Quete" marker. - Go down twice and talk to both "Quete" markers. A third one will appear afterward, then a fourth. - Go left twice to the outside. Go up, exit right. Four pink chests here: one slightly after entering, one after crossing the little path, and two after crossing the bridge at the top and bottom. - Return all the way to the building you started in. Sign anything you want and continue. Here you get the La Justice screen (tap screen in the middle). Adjust it so it sits at 70 <-> 0. It is necessary for the Aristocrat scale to be completely full and the Roturier scale to be completely empty. Confirm with bottom-right option, then left option. - Go left all the way, go up all the way. Talk to white "Evenement" marker. - Go up stairs. Enter bottom-left room. - Go up, talk to white "Evenement" marker. - Go up two flights of stairs and enter bottom-left room. - Go right all the way, go up, go up the stairs. Talk to white "Evenement" marker. - Go into blue part. - Enter right and buy your last book. Exit. - Go up all the way and enter right. - Exit down and talk to nearby white "Evenement" marker. - Go down all the way into blue part. - Talk to the minigame characters. - Go left all the way. Talk to black-haired guy with white "Evenement" marker. - Go slightly up and talk to guy in black hat with white "Evenement" marker. - Go slightly down and talk to lady with white "Evenement" marker. - Go right all the way, go up, go down the stairs. - Go left all the way, go up twice. Talk to white "Evenement" marker. - Go right, go down, go right and go into blue part. - Go left into the outdoors. Avoid the red guards and only talk to green "Quete" marker. - Talk to pink "Quete" marker that appears. - Go down into previous area. Talk to white "Evenement" marker. - Go right. Talk to white "Evenement" marker. - Go down twice, go right, go down, go up the stairs. - Take left door down, go left all the way, go up. Talk to white "Evenement" marker (partially hidden by chandelier). - Go right, go up, go down the stairs. - Go down all the way into building. All floors are unlocked, so go around collecting trash. - On second floor, examine in this order: Book in bottom-left room. Bookshelf in bottom-right room. Bookshelf in top-left room. Bookshelf in top-right room. Book in bottom-right room. Exit building when you're done. - Exit building. If you don't have all books, go buy them now. - Talk to blonde guy in red clothes with white "Evenement" marker. - Go up and talk to blonde guy in green clothes with white "Evenement" marker. - Go left twice to the outside. Avoid red guards and go up to blue part. - Go back down, go bottom-most right, go down, go right, go down, go up stairs. - Take bottom-left door, go left twice, go into blue part. - Return to stairs and go down them. Go up, go left, go up twice, go into blue part. - Go down, go right twice, go down, go up stairs. - Go left all the way, enter flashing blue room. - Go left, go up, go left, go up and talk to white "Evenement" marker. Play all the way through to the next MAP segment. After game autosaves, exit to Title Screen. - Go up, go right, examine pink chest. Go up the stairs. - Go left, talk to green "Quete" marker. - Go left, go down all the way, talk to green "Quete" marker. - Go right twice, talk to three green "Quete" markers. - Go right, talk to pink "Quete" marker. Examine bookshelf afterward. - Go up, talk to pink "Quete" marker. - Go left, examine book on table. Talk to green "Quete" marker. - Go right, go down the stairs. Talk to both green "Quete" markers. - Go up, talk to green "Quete" marker. - Go up, go left, talk to pink "Quete" marker. - Take the second-top right door, talk to pink "Quete" marker. - Go up, go right, go up the stairs (again). - Go left, go down and talk to green "Quete" marker. - Go right twice, talk to green "Quete" marker. - Go right, go up, talk to green "Quete" marker. Talk to pink "Quete" marker that appears. - Go left, talk to both green "Quete" markers. - Go right and go down the stairs. - Go up, go left, go up, go left twice to the outside. Avoid red guards and go up to blue part. - Talk to green "Quete" marker. Talk to the next green marker that appears on the right. - Go left twice, go up (next to blinking left door), go up again, examine bookshelf. - Go left into flashing blue room. Here you get the La Justice screen (tap screen in the middle). Adjust it so it sits at 38 <-> 58. It is necessary for the Roturier scale to be lower/heavier. Confirm with bottom-right option, then left option. - Go up the stairs. Enter bottom-left room. - Go right, go down, talk to white "Evenement" marker. - Go down, go up the stairs. - Take bottom-left door, go left all the way. Talk to white "Evenement" marker. - Return to stairs and go down them. - Go up, go left, go up, go left. Talk to white "Evenement" marker. - Return to stairs and go up them. - Take bottom-left door, go left all the way, go up. Talk to white "Evenement" marker. - Talk to white "Evenement" marker (sitting on left side). - Go right, go down, go right, go down, go up the stairs. - Take bottom-left door, go left. Talk to white "Evenement" marker. - Go up all the way, go right, talk to white "Evenement" marker. - Go left twice into white "Evenement" marker. - Enter bottom-most right door. Talk to white "Evenement" marker. - Go down, go right. Talk to white "Evenement" marker. - Go right, go down, go right. Talk to white "Evenement" marker. - Enter bottom-most right door. Go down, go right, go up the stairs. - Take bottom-left door, go left all the way, go up. Talk to white "Evenement" marker (on left, partially hidden by chandelier). Play all the way through to the next MAP segment. After game autosaves, exit to Title Screen. - Go down all the way into next building. Go up. Talk to white "Evenement" marker on the left. At the next choice, exit to Title Screen. - Go left. Avoid red guards and go up. Go right. Talk to green "Quete" marker. - Go further right and talk to green "Quete" marker. - Go even further right and talk to pink "Quete" marker. - Go left and talk to green "Quete" marker. - Return to where you started (big long room). Take bottom-most right, go down, go right. Talk to white "Evenement" marker. Here you get the La Justice screen (tap screen in the middle). Adjust it so it sits at 0 <-> 98. It is necessary for the Aristocrat scale to be completely empty and the Roturier scale to be completely full. Confirm with bottom-right option, then left option. - Go left all the way, go up all the way. Talk to white "Evenement" marker at the top. - Go down all the way, go right all the way, go up, go up the stairs. - Go down into next area. - Go up stairs, go into bottom-right room. Talk to white "Evenement" marker. - Go down stairs and leave building. Go down into blue part. - Take bottom-left door, go left all the way, go up all the way. Talk to white "Evenement" marker (partially hidden by chandelier). - Go down, go right twice, go up, go left. Talk to white "Evenement" marker. - Go right, go down the stairs. - Avoid red guards. Go slightly up and talk to white "Evenement" marker. - Go down to leave area. Talk to white "Evenement" marker right below. - Take bottom-most right, go down, go right. Talk to white "Evenement" marker. - Go up and talk to blonde guy in black clothes with white "Evenement" marker. - Go down into left alley. - Go back onto main road and talk to guy with white long hair with white "Evenement" marker. - Go down and enter left building. - Enter left. Exit after scene. - Go left to leave area. Go down, and down again into white "Evenement" marker. - Take bottom-most right, go down, go right, go down, go up the stairs. - Go slightly down and enter right. 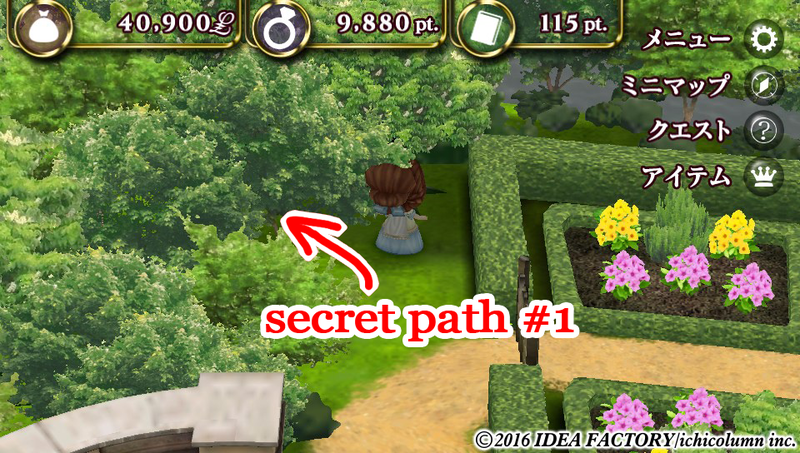 - There are secret paths, chests, and quests here not shown on the map. From the entrance, go up the dirt road all the way til you stop, then go left into trees. Keep going until you reach a small clearing. There is a green "Quete" marker mostly hidden by the trees. Above the marker is a pink chest hidden by the trees. - Another secret path. Cross the short bridge with wooden pikes, then immediately go down into trees to a small clearing. Talk to green "Quete" marker. There is a pink chest below him hidden by trees. - Open menu with , select first option for Completed Quest trophy. Back out and select fifth option, tap green jewel, get the 100 Justice Points trophy. - Return to entrance and leave the area. Go down, go down again into white "Evenement" marker. Here you get the La Justice screen (tap screen in the middle). Adjust it so it sits at 0 <-> 100. It is necessary for the Aristocrat scale to be completely empty and the Roturier scale to be completely full. Confirm with bottom-right option, then left option. - Go left all the way, go up all the way. Talk white "Evenement" marker. - Go slightly up and talk to white "Evenement" marker. - Go left all the way, go up all the way. Talk to white "Evenement" marker at top of room. - Go up into small room. Talk to white "Evenement" marker. - Go down twice into blue part. - Enter right. Talk to white "Evenement" marker on the right. - Exit store, go down into blue part. - Go right, go down either door, go left all the way, go up. Talk to white "Evenement" marker (partially hidden by chandelier). - Go left, go up, go left. Talk to white "Evenement" marker. - Talk to white "Evenement" marker near you. - Take bottom-left door, go left, talk to white "Evenement" marker. - Return downstairs. Go up, talk to white "Evenement" marker. - Go up and enter left. Talk to white "Evenement" marker. - Exit, go down all the way into blue part. - Go down and into left alley for a scene. - Talk to white "Evenement" marker above you. - Go right, continue right and talk to white "Evenement" marker. - Go down, enter left. 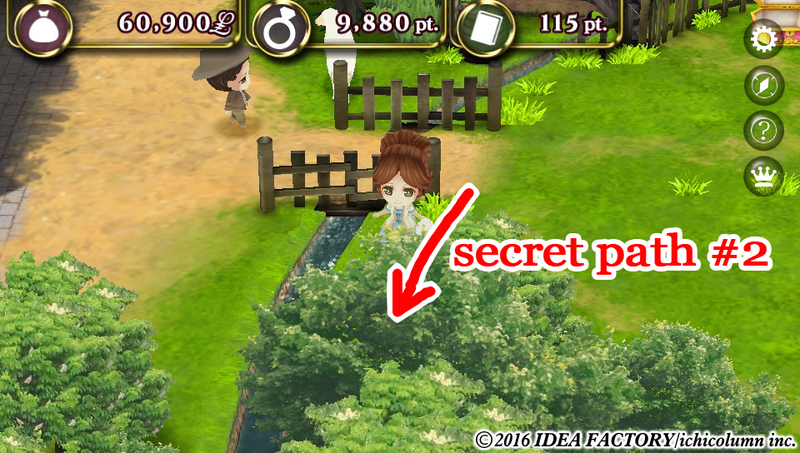 Note this route has many new scenes, so be patient while skipping. Here you get the La Justice screen (tap screen in the middle). If they aren't already, make the points equal. Confirm with bottom-right option, then left option. - Go down all the way, go right all the way. Talk to white "Evenement" marker. - If you're interested, this is your last chance to buy items from the General Store. - Talk to nearby white "Evenement" marker. 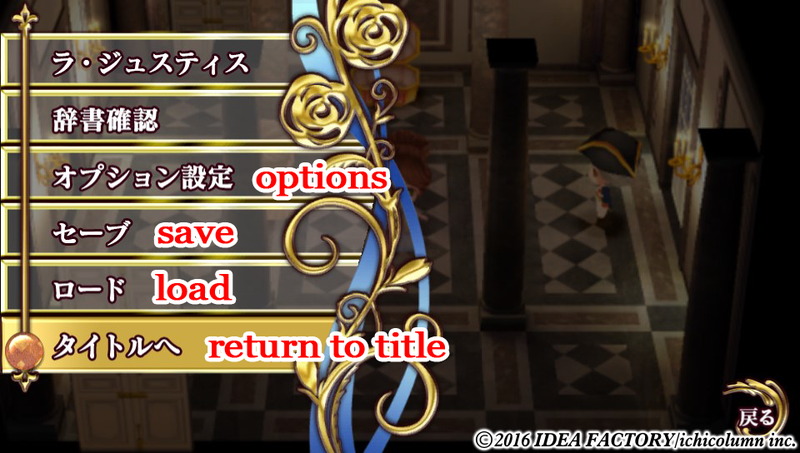 Select fourth option on Title Screen (CG). You can switch characters with and . For each character, select the bottom-right CG that is blinking white, play through the short story, then exit with right-most option on the bottom. You now have your Platinum! If for any reason you don't, you either 1) didn't adjust your Justice points correctly when starting a new game, 2) didn't talk to a certain character in MAP segments, or 3) missed a book or quest. Let me know what you're missing and I'll do my best to help you. Word of warning though, it will almost always require starting a new game. https://maistar.blog...entry-3772.html - Info on quests, items, etc. Wonderful job Sage. Got my play easily following it. I can't imagine writing it has been very easy. So thanks for the time you put in to it! - Playthrough 2, Fresen Route After getting trophy 17 you will have these map actions. - Go to either store and buy what you can. You should have all the books by now. - Toward the top of the map, talk to blonde guy in red clothes with white "Evenement" marker. In my case I had to talk to a lady in a green dress before I was able to talk to the blonde guy in red clothes, at the top of the map. - Playthrough 4, Robospierre Route. There are a dozen moments throughout the entire guide where when the guide says you have to go left, you actually have to go right. Or when you have to go right you actually need to go left. They are easily figured out by just using common sense. Only the one in Playthrough 4 is worth mentioning. - Go right into store, then exit after scene. - Go left into building. It's the other way around: go left into the store. And then right into the building. - Go right into the bookstore. Talk to white "Evenement" marker on the right. - Exit store, then go down into blue part. - Go right. Remember those two secret paths? Go to each to find two green "Quete" markers. - Open your menu with and select the first option for Completed Quest trophy. Back out and select the fifth option, tap the green jewel, get the 100 Justice Points trophy. I went to these secret paths again, like before. But there were no new green markers for me at neither path. So I opened up the menu, popped the trophies and just continued. Thanks for the help! I made the edits to the guide. Unfortunately I also noticed I mixed up left and right in several areas, and fixed as many as I could before posting the guide, but I guess I still missed some. Apologies for that, but like you said, it should be common sense since you'll be familiar with the map layouts by then. If anyone else is truly stumped, let me know. 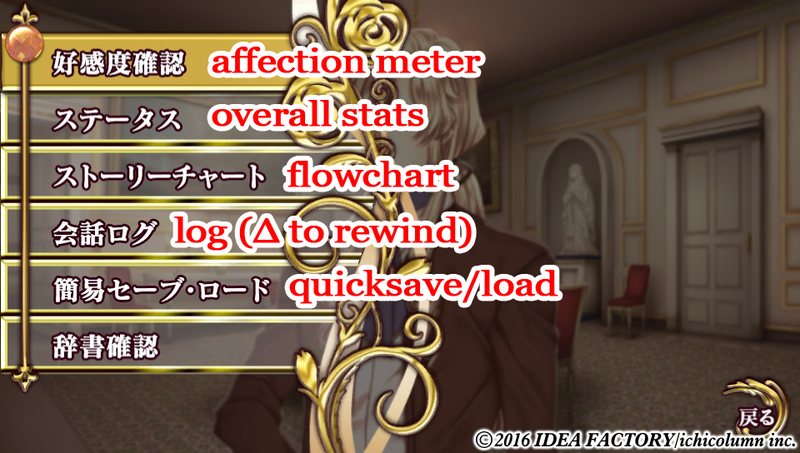 im missing one of the cg's for louis after playing his route several times...can someone help pls? If anyone is missing Louis's 8th CG (and consequently his 7th event), follow this guide. Note that the game will be longer with NG+ scenes, so be patient while skipping. Move La Justice points completely to the right (Roturier is full, Aristocrat is empty). MAP: Go left all the way, go up all the way. Talk to Evenement marker. MAP: Talk to Evenement marker at top. MAP: Go up stairs, go into blue flashing room. - Go downstairs, talk to Evenement marker. - Talk to second Evenement marker after scene. - Enter room above you, talk to Evenement marker. - Go up stairs twice, go into blue flashing room. - Go right all the way, go up, go up the stairs. Talk to Evenement marker near chest. - Go left all the way, go left into long blue flashing part. MAP: Go directly into blue part. MAP: Go up until you see blue part, and go into it. MAP: Go directly left into building. After scene, go down into blue part. MAP: Go up until you see white Evenement marker, but don't talk to her. Go right into building first. - Exit building, and now talk to white Evenement marker. - Go all the way down into blue part. - Go up until you see blue part, go into it. 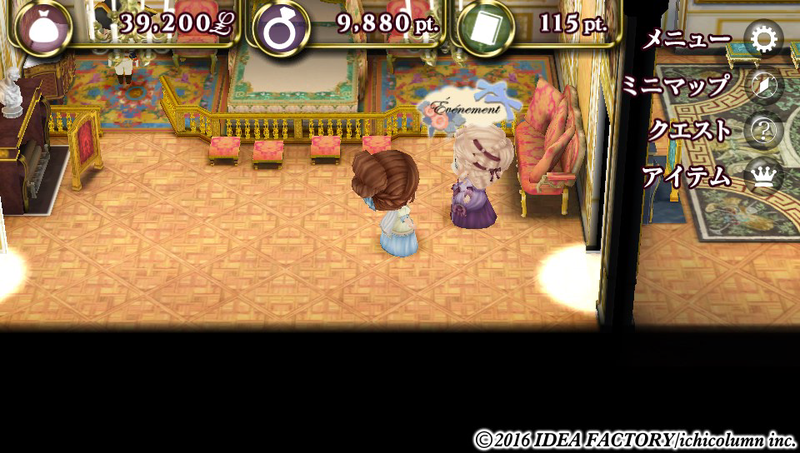 - Talk to both characters near you (lady in purple dress, guy sitting on couch). Back out of their respective minigames. - Go down all the way, go right all the way, go up, go up stairs. - Go left all the way. Talk to black-haired guy with white Evenement marker. 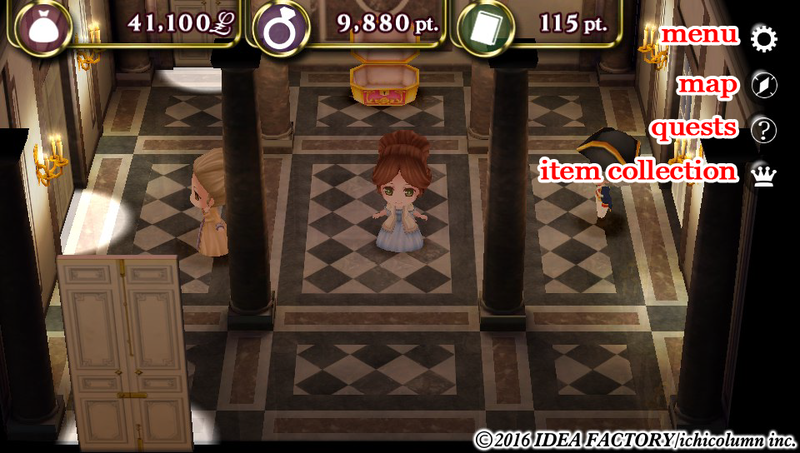 MAP: Talk to lady in dark dress with white Evenement marker. - Go left all the way, go up all the way. Talk to white Evenement marker. - Go up and talk to white Evenement marker. MAP: Go down into blue part. - Go left, talk to white Evenement marker (wearing same clothes as you). - Take bottom-most right door, go down, talk to white Evenement marker. MAP: Talk to white Evenement marker above you. Then go down into blue part. MAP: Talk to white Evenement marker next to you. Then go into blue part at top of map. You will get the CG and event after the following scenes. Wait till the next MAP section and the game autosaves (make a manual save if you wanna be extra careful), then exit back to title screen (last option on menu). I'm cleaning up this guide, mostly fixing mistakes with directions. 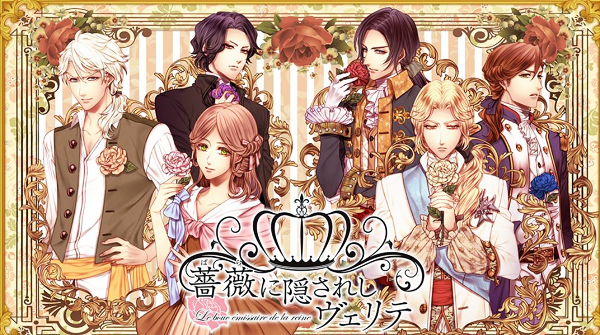 There were a LOT in Louis's route alone, sorry about that :') His part has been edited, I'll be going through the rest today. Edit: Clean-up complete. I also fixed the Quest and Justice Point trophies, you can get those earlier. The issue people had with Louis's route is Justice Point collection, which comes from books, so I've added when to buy books in his section. did you buy all the books in the bookstore? it's either that, or you missed a book/bookshelf earlier in the game. if i missed a book earlier what can i do? only three books you need to be on louis's route to get, the rest you can get on any route. unread books/shelves are flashing white. you might have missed a bookshelf on a wall since those are easy to miss. you said to place the weight on 70 to 0 but i can only go up to 68 is that fine? the 68 <-> 0. instead of 70 <-> 0 is probably because of that book you're missing. it's fine as long as the other end of the scale is 0. Edit: load up Save #2, play until the next map section. go right, go up. the book you're missing is the left bookshelf below the door (there were three in this room, all on the walls). 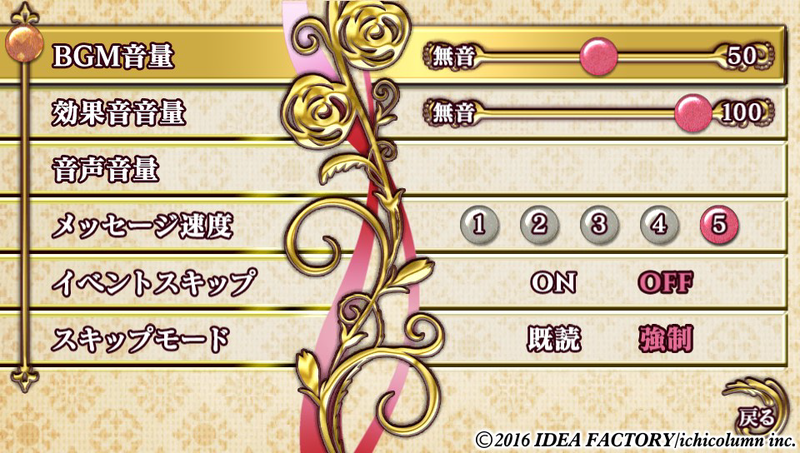 I think you can get here in chapter 3 (common route), but this save is for Louis's route. 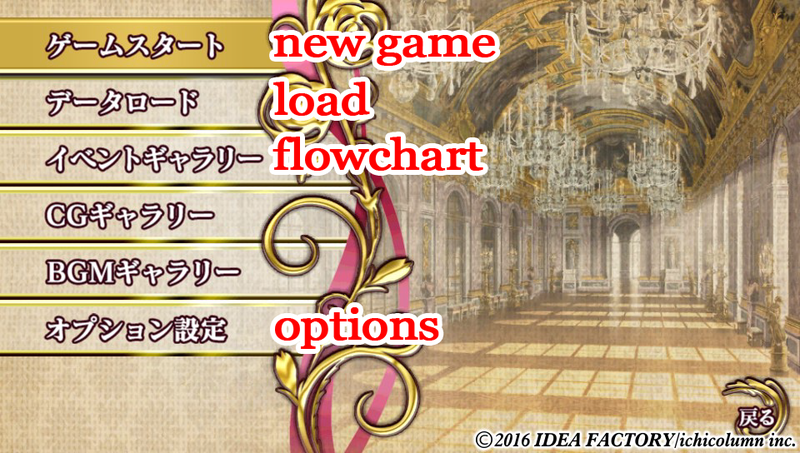 you can always just replay from here since you seem to be in fresen's route, so you wouldn't have much to replay. 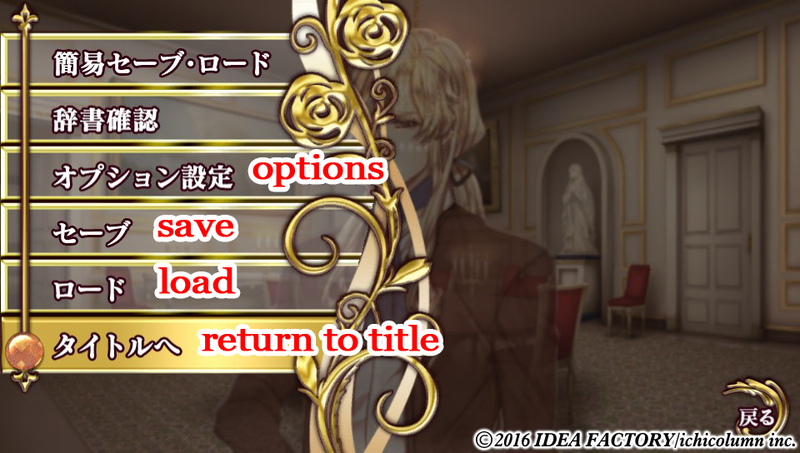 otherwise, wait till you're done with fresen's route, then redo louis's route. no problem! those bookshelves are sneaky. your points went down because you reloaded an earlier save. follow the guide from that save and replay. 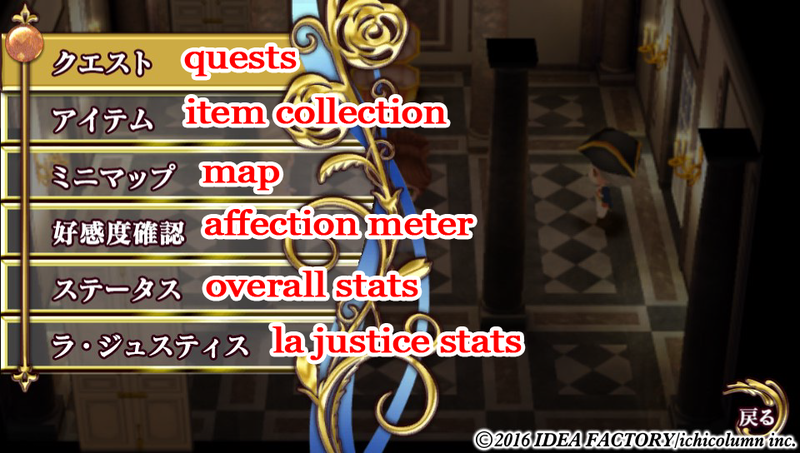 some of the quests you did will be reset (I think, can't confirm), so do them again and your points will get to 70 when you start fresen's route again.